​If you thought all miter saw blades were the same, think again! In fact, thinking this way is one of the worst mistakes the savvy tool-buyer can make. The simple fact of the matter is that if you’re going to invest in a quality miter saw, it makes sense to pick up the best miter saw blade money can buy. The reason is that regardless of how good the machine itself is, you can’t expect it to perform adequately without a quality miter saw blade. So it goes without saying that quality counts. In addition, you also need to think carefully about the type of miter saw blade you need. For example, what represents the best miter saw blade for hardwood might not be the best miter saw blade for laminate flooring. From the materials, you intend to work with to the precision of the cut, and so on, there’s plenty to take into account to ensure you buy the best miter saw blade available. To make things at least a little easier for you, we’ve shortlisted six of the very best miter saw blades money can buy right now. Exactly which suits your requirements best will vary in accordance with how you intend to put it to use. Nevertheless, we’ve personally selected and verified six seriously impressive tools – each of which represents the perfect package of unbeatable quality and outstanding value for money. ​First up, the DEWALT DW3106P5 60-Tooth Crosscutting and 32-Tooth General Purpose 10-Inch Saw Blade Combo Pack stood head and shoulders above the competition in terms of both quality and value for money. The kit itself comes complete with two blades, both of which are 10-inches in diameter and manufactured to the highest quality standards. The first blade - No.DW3103 (SKU 271.9524) – features 32 teeth, serving as an exceptional general purpose blade for all-purpose cutting in natural wood, plywood and wood composites. The second blade in the kit - No.DW3106 (SKU 656.4363) – features 60 teeth and is an extremely capable fine crosscut blade for fine crosscuts in natural wood, plywood and wood composites. Suffice to say, the fact that the kit combines these two truly superior miter saw blades for such an incredibly low price is impressive. As would be expected, both blades have been designed to minimize vibration, heat and the excess debris, while at the same time providing quick and reliable cuts with a variety of materials. What’s more, all tools and accessories from DEWALT come complete with extensive warranties for total peace of mind. 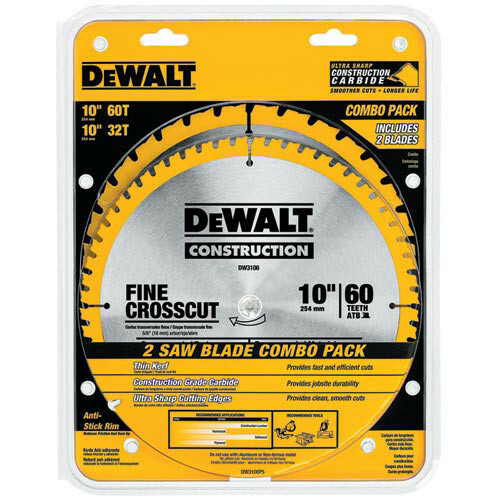 Easy to work with, durable in the extreme and enormously versatile, both of the blades included in the DEWALT DW3106P5 Miter Saw Blade Combo Pack come highly recommended. ​Despite having joined the market comparatively late, HICO’s 18 years in business have so far proved to be no less than revolutionary for the power-tools industry in general. Specializing in superior-quality tools and accessories for discerning tradesmen and professionals, the HICO 12" 80-Tooth ATB Thin Kerf General Purpose Saw Blade with 1-Inch Arbor is a testament to everything the company has achieved to date. Precise, durable and capable of dealing with an extensive range of materials, the HICO CBW12120 Miter Saw Blade is an impressive piece of kit that also represents enormous value for money. 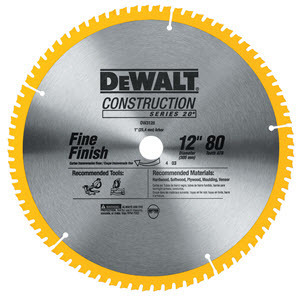 With a diameter of 12-inches, this fine-finish blade features 80 alternative top-level teeth and a kerf of 0.11-inches. Ideal for use with a wide variety of miter saws, table saws, and circular saws, the HICO CBW12120 provides an impressively fine-finish and delivers the goods in terms of speed and efficiency alike. Manufactured from the highest quality materials and guaranteed to go the distance, the CBW12120 Miter Saw Blade from HICO is the kind of no-nonsense blade you can count on for just about anything. 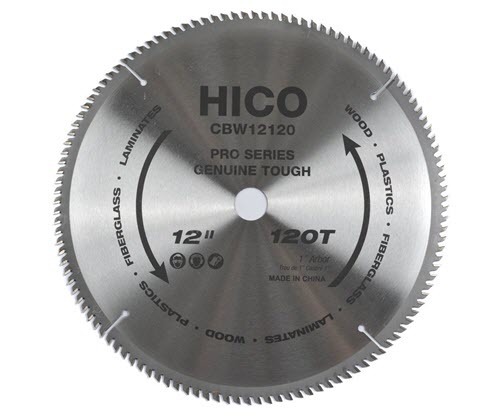 Earning the coveted silver medal position in our rankings, the HICO CBW12120 12" General Purpose Saw Blade is another premium tool that well and truly raises the bar in terms of value for money. 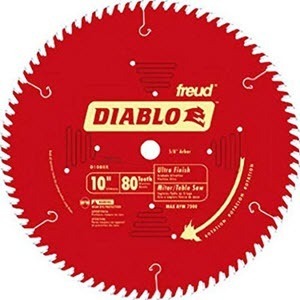 ​A brand that really needs no introduction when it comes to these kinds of tools, the Freud D1080X Diablo 10-Inch 80-tooth ATB Finish Saw Blade with 5/8-Inch Arbor and PermaShield Coating is an absolute must when it comes to fine-finish jobs of all kinds. Designed to provide the most impressively clean and chip-free results, the way the Freud D1080X Diablo tears through oak, pine, melamine, veneer plywood, and delicate molding is impressive, to say the least. Manufactured using the highest quality steel plate with high-density carbide tips, durability is delivered in enormous measures by the D1080X Diablo Miter Saw Blade. Along with slicing through even the toughest materials in no time at all, the resulting edges are so smooth and accurate that little to no additional sanding is required, which is precisely why the Freud D1080X Diablo comes highly-recommended for professional and domestic users alike. What’s more, the inclusion of laser-cut stabilizer vents significantly reduces vibration and noise during use, while at the same time protecting the blade from expansion due to extreme heat. Even when tackling the most intensive and extensive jobs, the Freud D1080X Diablo 10-Inch ATB Finish Saw Blade is the kind of blade that simply isn’t going to let you down. And if all this wasn’t enough, it even comes complete with a limited lifetime warranty from the manufacturer for total peace of mind. Once again, therefore, the kind of extraordinary performance and guaranteed value for money you can’t help but be impressed by. ​Like its counterpart right at the top of the list, the DEWALT DW3128P5 80 Tooth and 32T ATB Thin Kerf 12-inch Crosscutting Miter Saw Blade Kit is the all-around package for professionals and discerning DIYers alike. The quality and value for money delivered by DEWALT tools, in general, have always been extraordinary – this exclusive package taking things to an even higher level. The DEWALT DW3128P5 Miter Saw Blade Kit comes complete with two high-end carbide blades, one featuring 32 teeth and the other with 80 teeth. This, in turn, adds up to complete versatility when dealing with a variety of materials, whether focusing on speed or smoothness of results. Meticulously engineered and crafted from the finest materials, each blade has been designed to maximize balance and minimize vibration for complete comfort and control at all times. 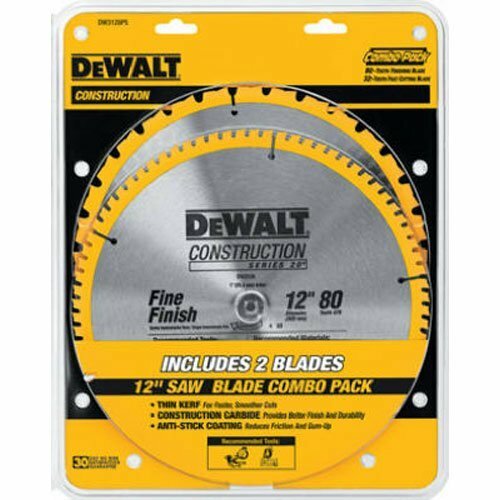 Compatible with most miter saws and table saws from major manufacturers, the DEWALT DW3128P5 Miter Saw Blade Kit is guaranteed to maximize the versatility and capabilities of any power tool. Simply fantastic value for money from one of the most reliable and reputable brands in the business. ​It’s difficult to know where to start when summing-up accessories like these. 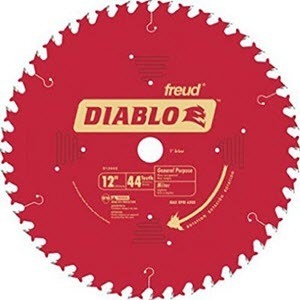 The reason being that the Freud D1244X Diablo 12-Inch 44 Tooth ATB General Purpose Miter Saw Blade really is about as good as it gets. Perfect for dealing with a wide variety of woods, the Freud D1244X Diablo rips through even the toughest materials with the kind of speed and efficiency you won’t believe. The build quality of the blade is no less than outstanding, featuring razor-sharp teeth with no less than five-times extended cutting life. The inclusion of laser-cut heat expansion slots provides protection from warping from extreme heat, while the vibration-reduction design maximizes both comfort and control while in use. 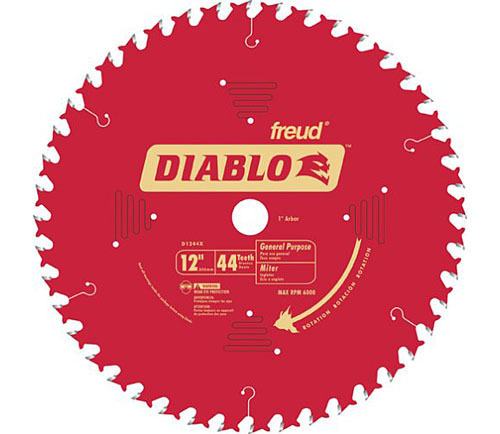 The Freud D1244X Diablo Miter Saw Blade is one of the best blades you’re ever likely to come across for slicing through oak, pine, plywood, pressure-treated lumber, and beams. But what’s even more impressive about the D1244X Diablo is the way in which it tears through even the toughest materials while still leaving a smoother and accurate edge. Additional sanding requirements are minimized, driving efficiency and performance with every cut. And as is the case with all blades from this world-renowned brand, peace of mind comes courtesy of a limited lifetime warranty. Enormous value for money and the kind of performance that goes above and beyond most blades in this class. 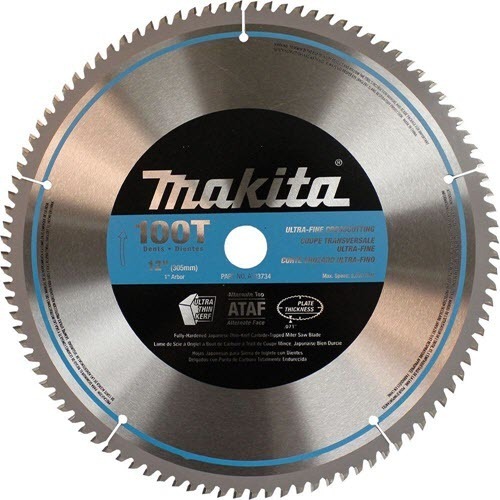 ​Last but not least, the undeniably-attractive Makita A-93734 12-Inch 100 Tooth Micro Polished Miter Saw Blade comes from a brand that’s synonymous with superior quality and durability, which in this case is exactly what you’re looking at – an outstanding-quality miter saw blade with 100 teeth, a diameter of 12-inches and a 0.91-inch kerf. Designed with the cleanest and sharpest results in mind, the Makita A-93734 Micro Polished Miter Saw Blade is all about accuracy and polished perfection. A superb piece of Japanese engineering with carbide-tipped teeth and an extraordinary mirror finish, the Makita A-93734 takes smoothness to the next level while minimizing drag and material loss. While it may not deliver the fastest cuts when dealing with tougher materials, the Makita A-93734 Miter Saw Blade nonetheless delivers the kinds of results you cannot help but be impressed by. All of which is made even more impressive by the incredibly low price the Makita A-93734 Mitersaw Blade is currently available for. 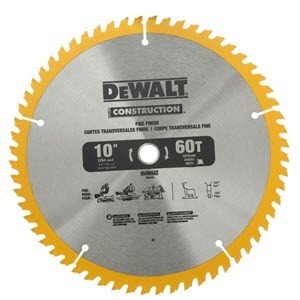 ​Shopping for the very best miter saw blade for the first time can be a confusing experience. If you’ve little to no prior experience, determining the best Miter Saw blade for your needs can be difficult, to say the least. You could be looking for the best miter saw blade for laminate flooring, the best miter saw blade for hardwood, a quality blade for ripping or something completely different. In any case, you find yourself presented with hundreds of options from countless manufacturers. The good news is that once you understand the basics, the process of selecting the very best miter saw blade becomes significantly easier. For one thing, the recommended applications for any given blade will usually be printed directly on the blade by the manufacturer. In turn, making it difficult to get this part of the process wrong! From laminate to aluminum to plywood to plastic, you should be able to see at a glance whether or not the blade is compatible with your requirements. Specialized blades are designed for a very specific purpose and therefore have the potential to deliver the best possible results. Combination blades are able to tackle a variety of jobs without needing to be changed, though may not get the job done quite as brilliantly as a specialized blade. ​Last but not least, the features of any given miter saw blade within any of the above categories may bring any number of specific features to the table. Price. Always establish your budget realistically and avoid the temptation to cut corners for the sake of saving pennies. The very best miter saw blades on the market may be significantly more expensive than their substandard counterparts, but what they deliver in terms of quality and value for money is beyond compare. Teeth. The general rule of thumb to follow when it comes to teeth is that the greater the number of teeth the blade has, the smoother the resulting cut. By contrast, fewer teeth result in more rugged and less precise lines, though tear through materials significantly faster. Tooth hook. The attack angle of the tooth (negative, neutral or positive). An aggressive positive hook produces faster cuts, but tends to increase tear out. Expansion slots. The presence of expansion slots in the blade helps prevent warping and damage in general, by providing the blade with a certain amount of expansion room as it heats up and cools down. Laser-cut features. Accuracy and quality of results in general can be improved by the arbors, expansion slots and laser-cut bodies. Coating. Countless manufacturers use innovative coatings to both protect the blades they produce and improve performance by reducing friction and corrosion.